I have always loved the idea of making truffles, yet it always seemed so daunting to me. Truffles sound so…gourmet or something. I finally decided that this year for Valentine’s Day I was going to give truffles a try. 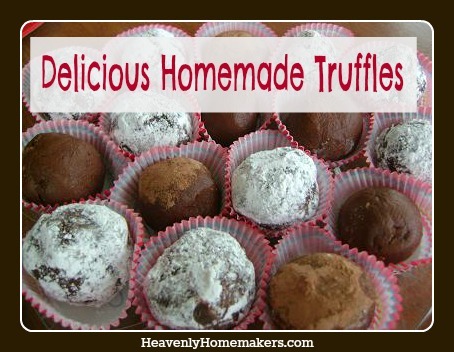 I learned that not only are truffles easy to make…they are quite an inexpensive Valentine’s Day treat. Do you KNOW how much truffles cost at the store? Yeah, a lot more than homemade ones. Not only are the homemade truffles less expensive, these treats don’t have high fructose corn syrup or hydrogenated oils in them! This first recipe is SO easy to make! Try this one first if you want to prove to yourself that you can make truffles. In a saucepan stir together chocolate chips, cream and butter over medium heat. Spread mixture into a pie pan and chill for about two hours. well…do I actually need to give you a reason? Dip in unbleached powdered sugar. Place on parchment paper and chill until set. This next truffle recipe takes a little more time to make, but it is SO WORTH IT. In a saucepan, cook and melt sugar, stirring with a fork. It will clump up at first while it melts, but it will melt if you keep stirring and heating. Remove melted sugar from heat and stir in cream. so take it back to the stove and heat and stir until it melts. it really will melt eventually (about 15 minutes). See, it finally melted. Now you have caramel. Remove from heat and stir in chocolate chips, vanilla and salt. Pour mixture into a pie pan and chill for about two hours. Roll mixture into 1 inch balls and chill on parchment paper until set. You can dip your truffles in a bit of cocoa powder if you want them to look pretty. They look pretty without the cocoa though, because hello? Chocolate and caramel all rolled into a ball? How could that not be pretty? Place your truffles into little Valentine muffin papers and you’re all set! I will present these truffles to Matt on Valentine’s Day, at which time we will have a conversation about whether caramel is pronounced Kare-uh-mel or Car-ml. He will say that he is pretty sure that it is Kare-uh-mel because there’s an “a” in the middle, and I will just sit there eating his truffles. How do you say caramel, by the way? It may seem like Matt and I argue over word pronunciation often, but really we don’t. Just KYOOPON vs. KOOPON and the occasional Kare-a-mel vs. Car-ml. And if those two marital issues are among our biggest, I’d say we’ll have a pretty great Valentine’s day. Hope you have a wonderful Valentine’s Day with your wonderful hubby! I am going to enjoy mine with my wonderful hub too! p.s. – I love your blog!! Carmel. The truffles look great! The peanut butter truffles look wonderful!! I wonder if they would work with carob? Sadly, I’m afraid they wouldn’t taste as good. I love chocolate, but can’t eat it. I’d say go for it on the carob! It will still taste good. Maybe add more peanut butter to overshadow the carob a little and make it more peanuty instead!? Oh my word…we both say coupon and caramel the same way. How do you pronounce crayon? Laura, as you can read in my english sometimes(…)I’m French, and as you know both “coupon” and “caramel” are french words. I’m going to try to “link” those words to pronounciations you have in english. caramel : “ca” like in “Ca”lifornia, “ra” like in “ra”dical and “mel” like in “mel”ting (three syllabes). coupon (not quite easy, I must admit..): “cou” like in bamb”oo” with a “c” “coo”, “pon” like in c”on”tent with a “p” : “pon”. That word comes from the verb ‘couper’ which means ‘to cut’. I have been visiting this site for over a year and have never commented on anything. But I just had to comment on this. In our family, I say Kyoopon and my husband says Koopon, I also say Car-ml while my DH says Kare-uh-mel. What about puh-con vs. pee-can? I vote for puh-con. Thanks for all your great recipes, I will try these for sure! I just spit on my screen, chuckling at your response!! LOL! Funny! I definitely say car-A-mel…I grew up in a town called Carmel, so there had to be a disinct difference in the sounds of those two words. Thanks for these recipes….they look so yummy, plus, I have a chocoholic husband, (and 3 yr old) so any chocolate recipes are fantastic!!! If I had a chocolate husband, he would have been eaten a long time ago. I am so thankful he was not made from chocolate. I say carmel either way. Just depends on my mood lol. The truffles look sooo good! I make plain chocolate ones the same way! The first time I made them I bought a tub of chocolate icing (baaaaaad I know) and used a mellon baller and then chilled them, then rolled them in powdered sugar. The pronunciation debate between carmel and coupon has been cracking me up. My husband pronounces the L in salmon, and uses Par-MEE-ZEE-an cheese on his spaghetti. Wonderful post! Thanks for sharing a healthier version of truffles! How many truffles do the recipes make? They sure look delicious. Each recipe makes 15-20 truffles. Thank you. I will certainly give these a try for our Agape’ Feast at the church. Be still my beating heart! Oh, my! These look divine!! <3 me some chocolate truffles! Those look so wonderful I want some right now. BTW I have those same cupcake papers I made some miniature cupcakes in them for a v-day party they were so cute!!! The dictionary lists both pronunciations, with care-a-mel being listed first, meaning it’s the preferred way. So what does Noah Webster know about car-mel anyway, he was probably an east coaster. So, how do care-a-mel people say caramel apples? I’ve NEVER heard the extra syllable. Do those people also say “di-a-mond ring?” I believe we should have a civil war and settle mispronunciations once and for all. I propose a bipartisan committee to take a survey, study the repercussions of mispronouncing the king’s English, and after spending 5 billion or so, write up a 2000 page report that can be voted on by the two houses of Congress. Meanwhile, let’s all eat Laura’s delicious truffles! Ha ha ha ha =) Thanks, Lois! Haha. Love it. You made my day! And I love the ‘let them eat truffles’ part! Very good recipe. these are so good. We tried the carmel truffles right away thank you for sharing the recipe!! Yeah I almost just ate the whole pot warm of the caramel ones. Can’t wait to taste them when they’ve cooled. They look mighty tasty!! Have you found a good chocolate without Soy Lecithin? It’s probably a good thing I was sick last week and over the weekend. I saved us a lot of calories! I don’t like truffles, never have. Upon seeing your ingredients though, it all sounded good, so I made a batch of the peanut butter ones. Delicious! They melt in your mouth. In addition to the powdered sugar you recommended, I rolled some in shredded coconut and others in crushed peanuts. Most I left plain though and they were all tasty. Several were shaped into hearts to give the plate a little festivity for Valentine’s Day. Thank you so much for sharing this delicious recipe. We paired it with the strawberry milkshakes and had a special dessert all-around. Why do you use sucanat and where could I find some? I LOVE to bake for my family and am looking for alternatives to white sugar. Thanks in advance and love your site! Sucanat is deyhdrated cane sugar juice, the least processed form of sugar and the most nutritionally dense. I order mine through my health food coop, Azure Standard, or you can get it through Amazon and health food stores. I’m a mid-atlantic gal and I say CARA-MEL and COO-pon. (And puh-can). I had to train myself out of saying “warsh” for wash (my mom and aunt still use the extra R) and “uhng-yun” for onion (un-yen). Car-ml, kyoo-pon, and puh-con here in East Texas. Well, I am a girl raised in the south by a bunch of yankees :oP SO, I say Care-eh-mull, peh-con, and kyew-pon. Right, isn’t that weird?? I didn’t believe it myself until I tried it. It really does turn to liquid! LOVE THIS POSTING!!! Laughed all the way through it. Ever heard of cutting on the lights for turning on the lights?? Love the idioms that cultures bring into our lifes. The recipes look great too. :):) Planning on using them tomorrow. What kind of chocolate chips are you using in these recipes? They all contain so much sugar and wax and stuff. Do you think you could use unsweetened baking chocolate and some sucanat? Would that work? Can’t wait to try this recipe. One question. Should I use white sugar or brown sugar instead of sucanat? Can I just use the chocolate chips that you can make at home? You know, with your recipe? HAHA…My husband and I “argue” over words quite often! I grew up in Virginia and he is from Boston, so its actually quite histerical…two TOTALLY different ways they teach english in school, apparently most words end in -AH and not -R. Like I say “Sug-ar” he says “sug-ah” … but then again, I also say “close the light”, even though you would really “turn it off!” we compromise, thats what a relationship is all about! ITs all in good fun! I made the Peanut Butter Truffles & it’s impossible to stop at eating just one!!! My family loves them & I can’t wait to try the Chocolate Caramel Truffles too. Well, I made the Chocolate Caramel Truffles today. I cooked the caramel mixture too long, trying to get rid of every bit of hardness (maybe the heat shouldn’t have been up to medium). When I mixed it with the chocolate chips, it got a little crumbly, so instead of rolling it into balls, I just broke it into pieces. Wow, it is delicious! I’ll probably be making them again, but will try cooking the caramel on a lower heat.